The Stanford Invitational will take place this Friday and Saturday. You can check out the time schedule and confirmed entries in the links below. In the meantime, please feel free to comment below on who you believe will win the following individual events as well as the teams that will win the different relays. If you have a projected winning time and/or mark, even better. Caice Lanovaz Los Gatos 18'11.5"
Austin Laut Oak Ridge 15'7"
You can find both of those links HERE. You can also still make your predictions for the Arcadia qualifiers at this LINK. You can get it at this LINK. The heats will be posted as soon as I get them from the meet director. You can check out the entire race at this LINK. Her time above converts to 10:33.4 (approximately) for 3200m. and may be even faster considering the indoor track with many more turns. 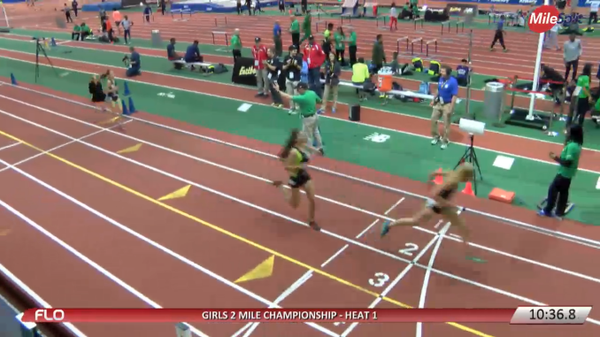 Just won her 2mile heat at the New Balance indoor championships ( NEW YORK ) in a amazing and one of the guttiest races I've ever seen. Congrats to Rylee on a nice 2 mile PR (10:37.13)"
Here is her interview after the race at this LINK. Photo below courtesy of milesplit.com and @milesplit. You can also another slow motion video and angle of this jump at Facebook posted by his coach Steve Nelson. The 2015 Dublin Distance Fiesta Boys 3200 will feature THREE guaranteed spots into one of the Saturday night Arcadia 3200 heats for the top finishers at the Fiesta, including an Arcadia "Invitational" section (fastest) guarantee for the race winner! 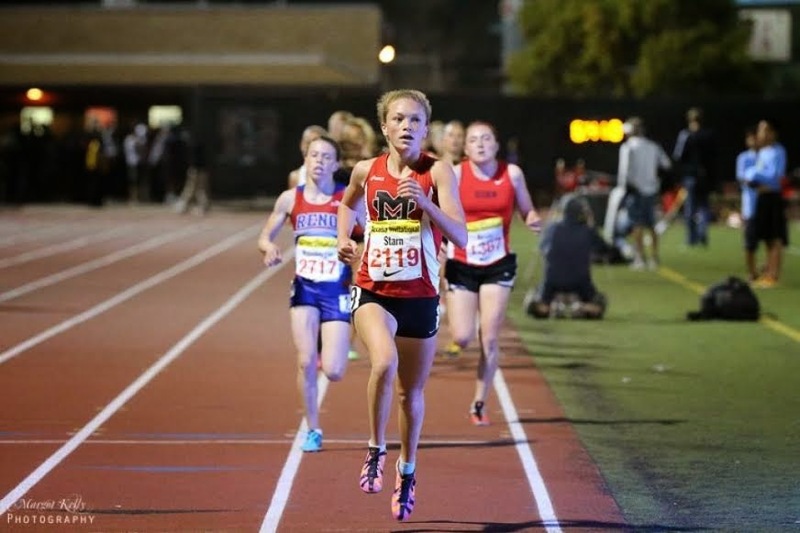 The Girls 3200 will feature a guaranteed spot into the Saturday night Arcadia "Invitational" section 3200 for the race winner at the Fiesta! Just another reminder that the entries close this Sunday, March 15, 2015 at 6:00 PM at www.athletic.net. Please also forward our "Winner" shirts survey to see which color shirt your student athletes would like to win. It can be found at https://docs.google.com/a/dublinusd.net/forms/d/1IpTJium-ehnyiK3odStBzMy3gmHxDjXzYmQYJInsi3g/viewformand will also close this Sunday. Where will you be competing this weekend? A preview of the K-Bell Invitational will be posted on Friday. If you have information on other Invitationals, please feel free to include that in the comment section below. Best shot put mark in California, Valley Christian SJ's Elena Bruckner's 49'0"
From Willow Glen Invitational. Valley Christian SJ junior, Elena Bruckner won the shot put with the #1 shot put mark in CA, 49'0". You can watch that throw in the video above. Her previous outdoor best was 46'1.5 from the 2014 CCS Top 8 Meet. Bruckner also won the discus with a best mark of 152'8". Her previous best was 129'1" from the 2014 CCS Finals. Two huge marks early season. You can check out my interview with Brooke at this LINK following her double victories at the Dan Gabor Invitational this past Saturday. Interviews with some of the top performers from this past weekend. If you are interested in hearing from any particular athlete(s), please let me know below and email me their contact information at albertjcaruana@gmail.com. Santa Rosa freshman, Kirsten Carter to the left courtesy of Michael Lucid. She won the 100m. (12.31), long jump (18'11") and anchored winning 4 x 400m. relay team in 57.8 at the Big Cat Invitational. 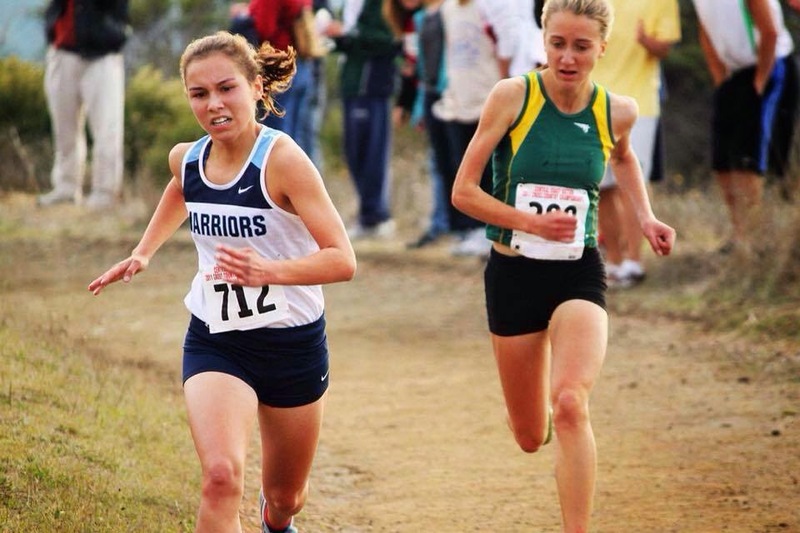 Check out article in today's Press Democrat at this LINK which also details fellow freshman phenom, Rylee Bowen of Sonoma Academy. The Golden West ALS chapter and two of Jim's University HS XC runners (Julia Lu & Wyeth Coulter) are planning a fund raiser in memory of our esteemed friend Jim Tracy. So I am asking you to help out by entering to run/walk the race, volunteer to help, be a sponsor , make a donation to ALS or spread the word to your friends about the race. I hope to see some of you there. Race: Sunday, April 12th, 8am-11am. You can also donate money which will be directed toward finding a cure for ALS in Jim's name at the website link above. Complete heats now posted. A meet preview will also be posted by tomorrow. Here is the list of NorCal meets this weekend with as many links as I can find. What Invitational will you be attending? What are your goals? Any featured races? March 7: Mt. Pleasant Relays at Mt. Pleasant HS, San Jose (CCS) Heats included in link. Advice from 1000m. 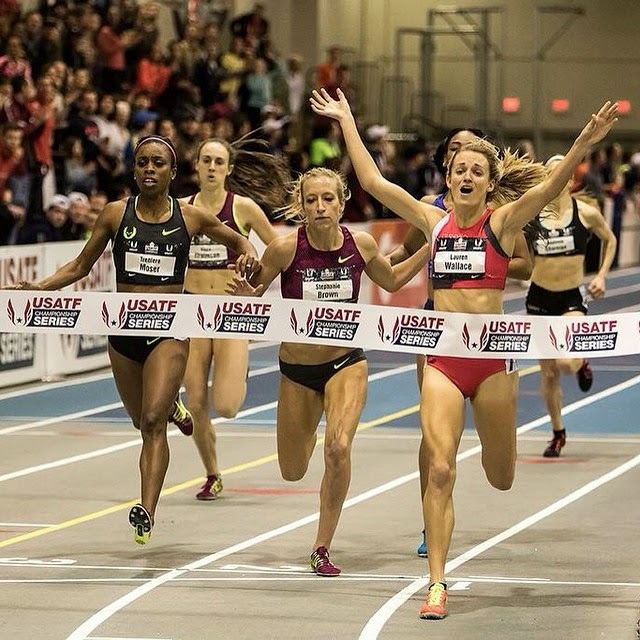 USATF indoor champion, Lauren Wallace. Lauren Wallace, Ukiah HS graduate won the 1000m. USATF title yesterday with a fantastic finish that you can see below. For those of you that are not familiar with her, Wallace ran primarily the 100/200 in high school and moved up to the 800m. in college at UC Davis. You can watch her entire race at this LINK. You can also check out the complete results at this LINK which includes former Sacred Heart Cathedral/Duke runner Shannon Rowbury sweeping the mile and 2 mile races. 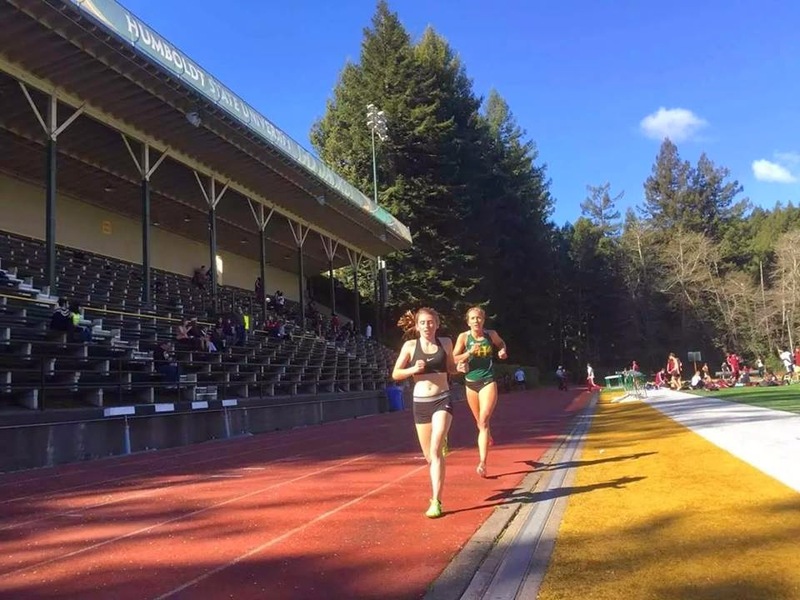 McKinleyville junior, Morgin Coonfield, won the College Invite 3K in 9:56.59 over top Humboldt State runner (both pictured here courtesy of McKinleyville HS coach, Jason Lewis). If you have any photos from the above invitationals, please feel free to send them to albertjcaruana@gmail.com and I will be happy to post them.